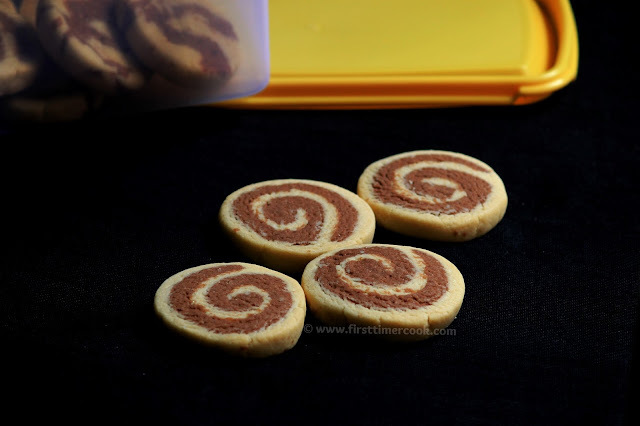 Eggless choco pinwheel cookies or choco swirl cookies !! Wow, i just did it finally. It was on my to-do list since a long time. Here the chocolate cookie dough & the vanilla cookie dough rolled together in order to make the most stunning looking cookies. They mostly taste like a mix of chocolate & plain vanilla cookie. 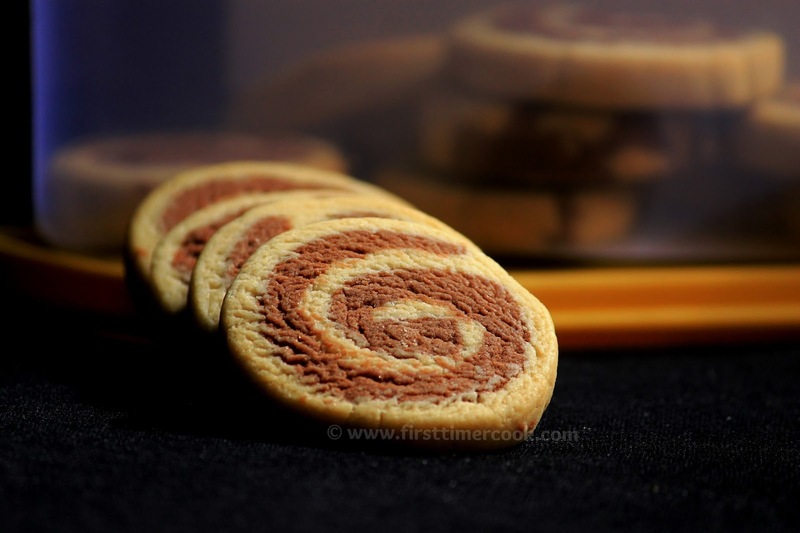 These cookies are super fun to make with the spirals of chocolate and vanilla dough. Also just in time, you can bake a large batch of choco pinwheel cookies / choco swirl cookies by using the below mentioned ingredients and steps. First we'll prepare the plain cookie dough and then chocolate cookie dough. In a bowl sieve flour (1 cup), salt (1/4 tsp), baking powder (1/2 tsp) together. Mix it well and keep aside. In a separate mixing bowl add 1/3 cup butter (at room temperature), 1/3 cup sugar, 1 tbsp milk and 1/2 tsp vanilla essence and whisk together to form a creamy structure. Now add the flour mixture and mix well to form a smooth dough. Add 2-3 tsp of extra milk if needed. Wrap in a plastic wrap and chill in fridge for 30 minutes. Repeat the same above way for chocolate cookie dough. Here add cocoa powder while sieving flour, salt, baking powder. After 30 minutes take out the dough, first roll the plain cookie dough with a chapati roller on a butter paper till just about 1/4 inch thickness and keep it aside. Next roll the chocolate cookie dough and transfer it over the top of plain cookie dough rolled sheet. Next starting at the end nearest you, begin rolling up the dough into a tight roll. Wrap and chill in freezer for 30 minutes. Meanwhile preheat oven at 180 deg C for 10 mins. Take out the tightly rolled dough from fridge, thaw for 1-2 minutes. Then cut into ½" thick cookies. Take carefully and place the cookies on the baking tray lined with butter paper. Bake for 15-20 minutes or until the edges turn golden brown. Switch of the oven, allow the cookies to cool in the tray itself for few mins, then cool them on a wire rack. 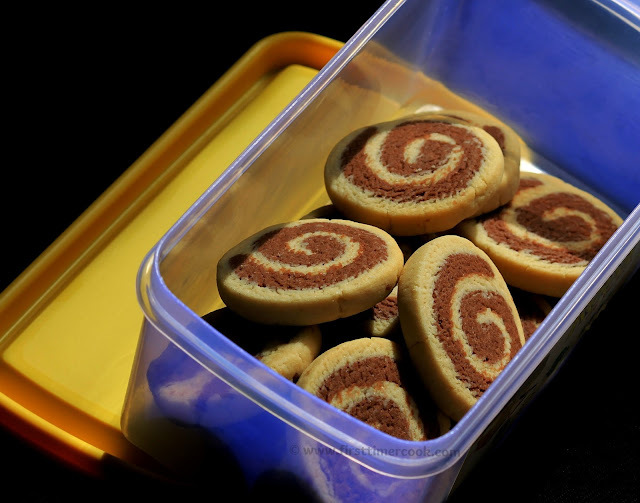 Once cooled, store them in an airtight container until serve ! You can add full all purpose flour / add half of all purpose flour and half of wheat flour / add full wheat flour. While adding milk in the dough, don't be tempted to add more milk. Just add to bring everything together to form a dough. Hope you have liked the above recipe 😊. If so, then please don’t forget to share it with your friends. You can also keep in touch with me through Facebook, Google Plus, follow my posts on Twitter too. Try this dish at your home and share your experience with me in the comment box below 👇. © Copyright 2019 First Timer Cook by Sasmita, All rights reserved.